Trump’s administration is acting quickly to dangerously reimagine reality. 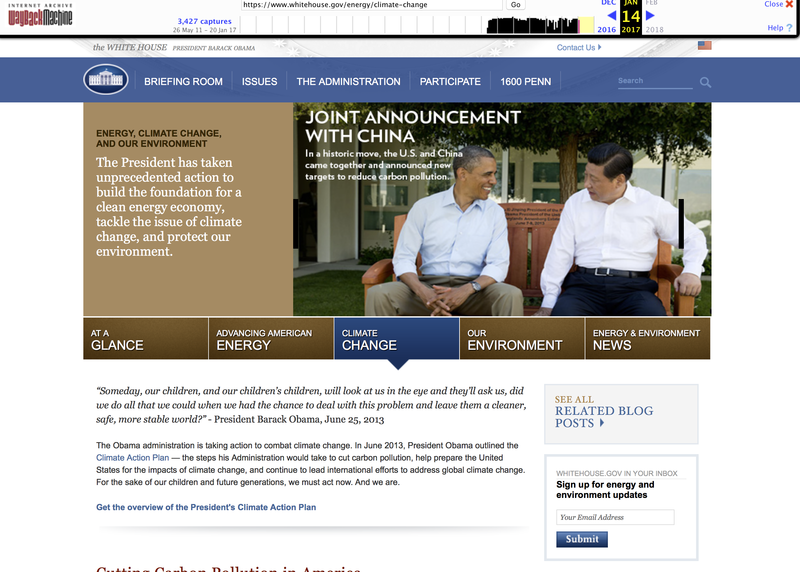 It has deleted all specific mentions of “climate change” and “global warming,” as well as removed an entire page dedicated to the subject at the http://www.whitehouse.gov/energy/climate-change URL, which is no longer an active link. UPDATE: While it’s typical to archive previous administration pages under new leadership, as Snopes.com points out, the fact remains that the new White House page removes mention of “climate change” and promotes a new energy policy page which specifically states it will pursue the elimination of key environmental policies like the Climate Action Plan. Motherboard noticed the change when it occurred at noon ET, when the official changeover took place. A screenshot of how it appeared under President Obama is included below for references, and you can view a live version courtesy of the Wayback Machine. The White House official website also used to list Climate Change as a “Top Issue,” but now the closest equivalent is “American First Energy Plan,” which leads to a statement about Trump’s broad policy goals in terms of U.S. energy policies, focusing on protectionist resource usage measures. As of this writing, the EPA.gov website still lists “Climate Change” as one of its most popular environmental topic pages, so the official government agency overseeing environmental issues at least acknowledges the existence of the world’s most pressing ecological issue. That may change, however. Motherboard reports insiders are skeptical that the EPA’s web presence will survive untouched under the new administration, and the new White House policy overview on energy policies says it will reset the EPA’s focus on protecting clean air and water domestically. These kinds of dangerous and irresponsible changes to institutional repositories of public knowledge on serious issues agreed upon by the vast majority of credible experts are unlikely to be isolated. They could also have a profound impact on the availability of environmental data, and of course policy changes that follow from these immediate positional shifts are likely to have considerable effect on startups focused on green and clean tech projects. The official White House page for LGBTQ rights was also removed when the turnover occurred.